Almost all of Southern Ontario is under a winter storm warning right now (MAP) - Canada Eh? Toronto is not the only city under a winter storm warning right now. Almost all of Southern Ontario is dealing with blowing snow, ice pellets, and hazardous wind prompting warnings all around the province. In Toronto, the total snowfall and ice pellet amounts are now forecasted to be up to 25 cm by the time snow tapers to flurries on Wednesday. 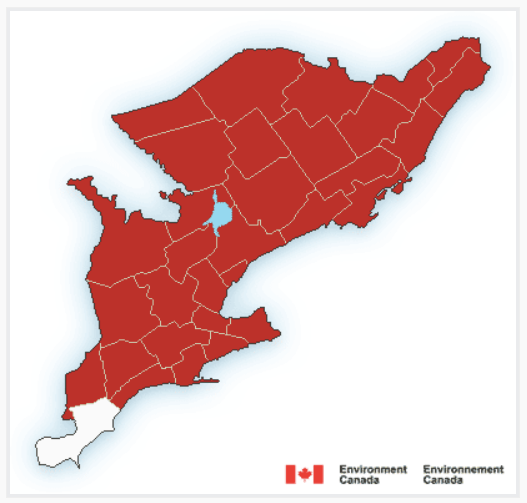 As of 3 pm on Tuesday, almost every place in Southern Ontario was under a warning… except for Windsor it seems. While the storm heavily affected travellers at Pearson Airport, it seems like most people got the memo about staying indoors in Toronto, as some TTC vehicles were almost empty during rush hour earlier today. And hey, at least we’re not Ottawa right now. The capital city is expecting a snowfall that may amount to 40 cm by Wednesday. Might want to stay inside this evening, Ontario.